To kick off our web feature series, we bring you glimpses of three women cooking from the heart and sharing their worlds through food. Food connects us to home. The smells of family-recipe bread baking or a roasting holiday ham send us right back to our childhood kitchens, licking spoons and sneaking extras. For first-generation Americans, food represents so much more. It’s a chance to bring memories from faraway homes to life—and to introduce these places and journeys to others through dishes, ingredients, and teaching. The Southern Foodways Alliance documents the diverse food cultures of the South—and to kick off our web feature series we bring you glimpses of three women cooking from the heart and sharing their worlds through food. “When I wear these dresses, I feel like I am fifteen years old…born again.” Maria wearing one of the dresses she sews for herself. 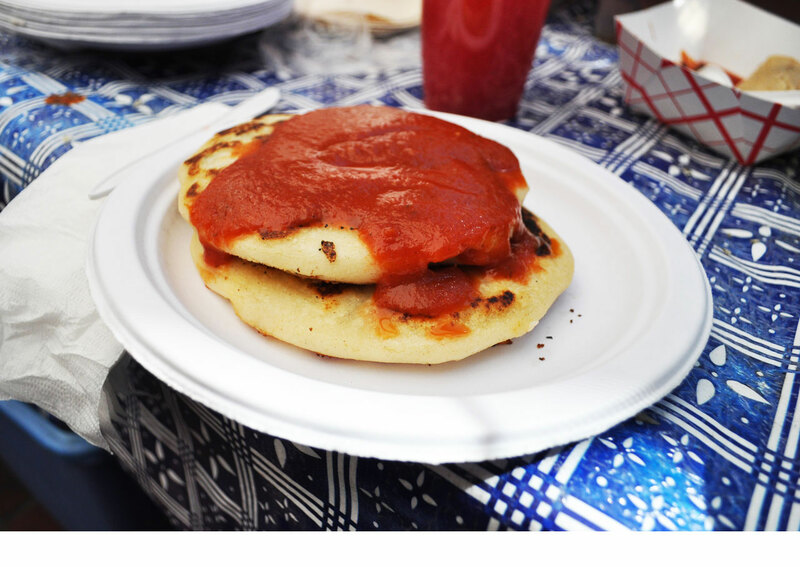 To taste Maria’s pupusas is to know her journey, family, and her dreams. The SFA spoke with her at La Cocina, an incubator for food entrepreneurs in San Francisco. 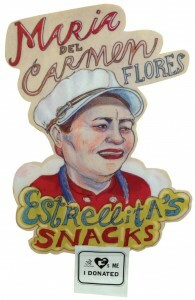 There, Maria runs Estrellita’s Snacks and sells at markets and food-truck fairs across the city. 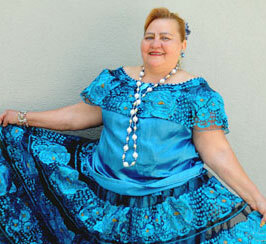 Maria has sold snack foods all her life, first walking the streets of San Salvador as a young girl. 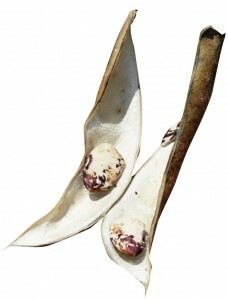 In Mexico City, she found a tree near a train station, and “with 100 pesos I bought a carton of beer, some beans [and] a kilo of tortillas…The business was full of people, under a tree, with a colorful blanket.” Her customers nicknamed her joint The Dreaming Rascal. When she arrived in San Francisco, it was making banana chips that allowed her to leave her bartending job, rent her home, and tap back into her entrepreneurial spirit. “I wear (my tropical pumpkin) over my shoulder. 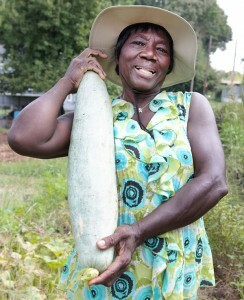 I call it my baby.”—Haylene posing with another one of her vegetables, a squash. 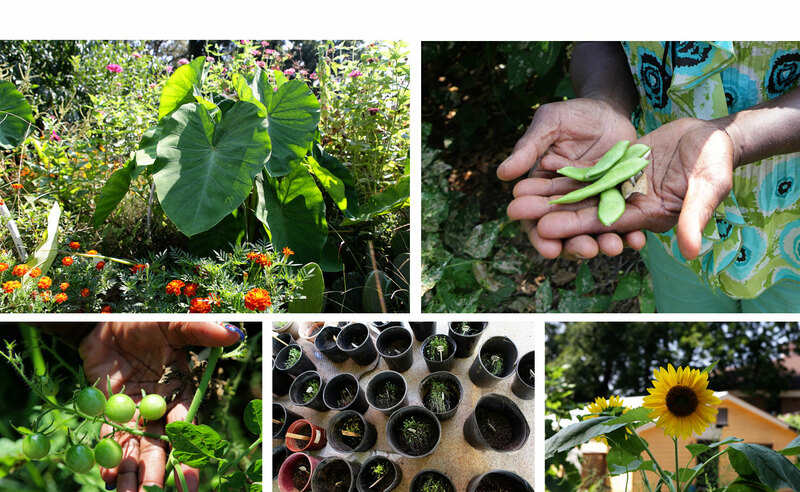 Haylene knows anyone can garden, no matter where they are. 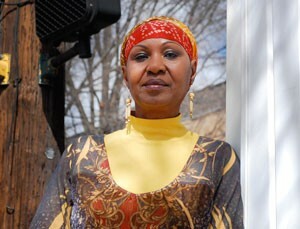 Ida Ma Musu escaped Monrovia, Liberia in 1980, in the early days of civil war. It took her years to find her children and bring them to the United States. “I can’t afford to cry, I can’t afford to fall apart,” she would tell herself in those early years. “I have to stay strong.” She opened Braids Out of Africa, but soon felt the need to pass on the cooking wisdom she learned from her grandmother to her customer’s daughters. 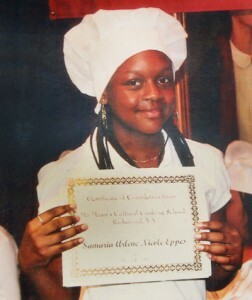 A graduate of Chef Ma Masu’s Cultural Cooking School. To taste Maria’s banana chips, Haylene’s tropical pumpkin soup, or to eat Ida’s soulful African cooking is to better understand their journeys and to glimpse their most cherished memories of home. The kitchens of these women, and so many others like them, are redefining the foods of the South. 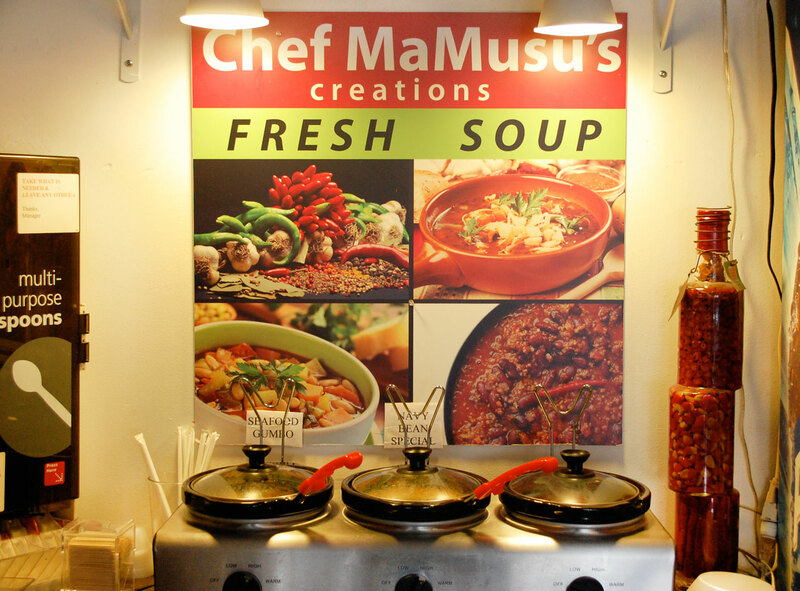 Chef Ida Ma Musu of Richmond, VA shares her take on southern cooking, by way of Liberia. UP NEXT: Discover a few of the beloved, trusty tools of cooks, pitmasters, and more. This feature was produced with oral history interviews, audio, photographs, and video from the archive of the Southern Foodways Alliance and the Southern Documentary Project.